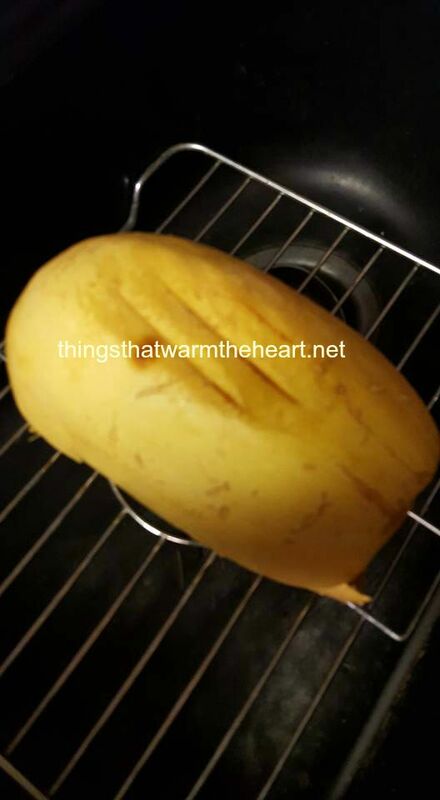 It has a very hard and tough outer skin, yellow in color, oval shaped, and a stem like a pumpkin. You can cut it in half remove the seeds before cooking if you like, but I find that it is easier to cook it first. Pre-heat an oven to 350 degrees. I prepare the squash by cutting off the stem about 1/2 inch from the end. In the above picture it has been removed. Like I said it is tough and I suggest doing this very carefully and don’t let the knife slip. Look on the cut section and you may see a core in there and it goes down about another 1/2 inch, I cut this out with the tip of the knife and demonstrate it for you in the video. It leaves a slight indented hole in the cut end. I cook a small to medium sized on for about 45 mins, but, I like mine to be a bit crunchy. If you like a softer texture cook an additional 10 minutes. The squash has no taste on it’s own so there needs to be a sauce or something to go over it when eating. Now while it’s in the oven I prepare my sauce. It can be White Alfredo, you can add meat if you’d like. You can make a pesto if you prefer, or just melt a bit of butter and add garlic and Italian seasoning blend and stir it in with some olive oil and pour it on like a dressing. You can add freshly grated Parmesan to the top also. I happened to make a red meat sauce for mine. With a spoon scoop out the inside of the squash all the way to the peal and separate the strings. Pour dressing or sauce over the top and serve. 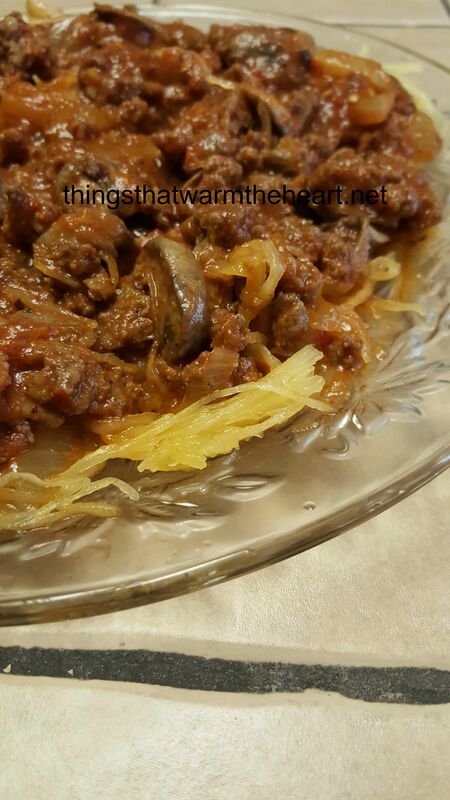 Easy, peasy, healthy and delicious! Again you can watch the video by clicking here now. Tomato sauce or paste, whatever you like to use to make your red sauce. Brown the ground turkey, drain and add the onion, garlic, seasoning and essential oils, stir. Add your red base and let simmer until your squash is done. You may want to cook it earlier and let it simmer all day if you’d like. To see my video showing you how to make this quick and delicious vegetable spaghetti. Perfect if you are eating Paleo! Easy if you are vegan to make a meatless sauce and guess what??? 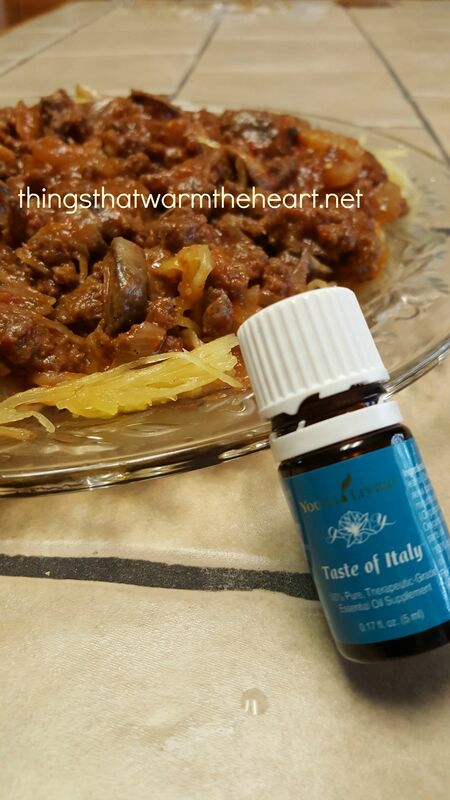 I was even able to use my Young Living essential oil Taste of Italy, which is a nice fragrant blend of 4 different Oregano’s. Want to watch the video? Here is the link!